Libraries do not exist in a vacuum – they are there to serve. Through providing access to knowledge, as well as an open, welcoming public space, they help others help themselves. But they are also dependent on external support. This isn’t just about the politicians, officials or senior management who decide on budgets, staffing, or laws. It’s also about those who influence the decision-makers, about public opinion itself. To thrive, libraries and librarians need to work to shape the environment around them, and build a community which doesn’t just have sympathy for the library, but are ready to act for it. And the best way to do this is to advocate. Too often, advocacy is seen as something for the few, for senior management, for the extroverts. However, as IFLA’s Global Vision Summary Reportunderlines, every librarian should be an advocate. This does not mean that every individual librarian should try and organise a meeting with the mayor, or go on TV. There are many different ways of getting involved from advocacy. It also doesn’t necessarily require you to go on a course, or receive other training, even if these certainly make a difference. 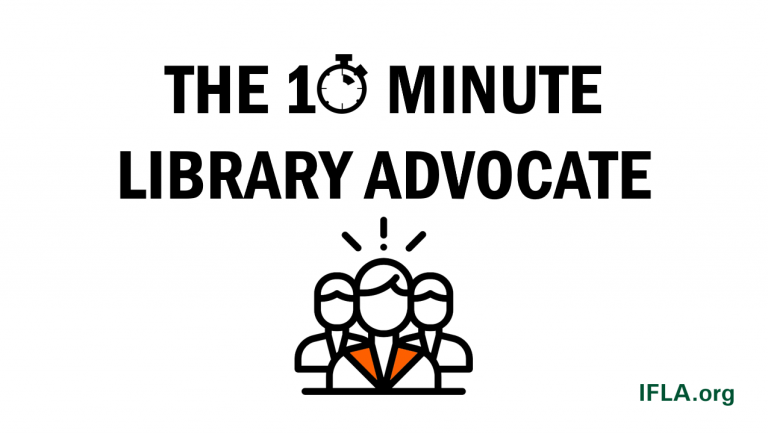 There are lots of things that you can do – even in ten minutes – both to think and to act like a library advocate. And this is what this series is for. Every week, we will be presenting one idea for an activity that will contribute to stronger advocacy for libraries. Not all will be suitable in all situations, or to all personalities. Some will be about planning, thinking, rehearsing your arguments. Others will be practical, and bring you directly into contact with users and others. You won’t be able to do all of them, but we certainly hope that everyone can do some of them. Each idea will include a short description, and often suggestions of places you can look if you would like to (and can) go deeper. And of course, we encourage anyone interested to find opportunities to learn more about advocacy, and get more involved. So we hope you’re looking forward to getting started. If you spend ten minutes, ten hours or ten days, you will be supporting the future of our institutions and our field.